Inspire others through your speaking. You seem to have a knack for making people feel at ease when you speak. Maybe you've been told that your speeches or presentations are inspiring. Maybe you feel led or called by God to speak to large groups of Christian women to stimulate productive and positive thinking or to encourage women in their faith. Becoming a Christian women's speaker is all about preparation, networking and practice. Examine why you want to become a Christian women's speaker. Discovering your purpose in becoming this type of speaker will direct your professional growth and determine where you start looking for speaking engagements. Identify the ideas or passions you want to speak about and narrow them down to one specialized topic. For example, you could give speeches or presentations on how to juggle ministry and a household, how to find your true beauty as a woman in God's eyes, how to manage emotions in a biblical way, or how to become the woman God wants you to be. Write down your message in its entirety on paper or on a computer. Then write it out in the form of talking points or an outline. If you find it more helpful to have key points of your talk on index cards, then use them. Practice giving your talk several times in front of empty seats or willing friends or family. Talk with your pastor or other church leaders and let them know you are in the process of becoming a Christian women's speaker. Ask them if there are any upcoming events when you can give your first official talk. Your pastor may schedule you for your first speaking engagement, work with you to create an event where you can speak, and help you smooth out your message. Start networking with organizations that can benefit from your speaking services. For example, contact domestic violence shelters or the local department of human and social services to find events that need a speaker. Create an online presence using a social networking site such as MySpace, Facebook or Twitter. Continue using networking and word of mouth to advertise your speaking services. Read through your presentation several times before delivering it to help get it into your mind. 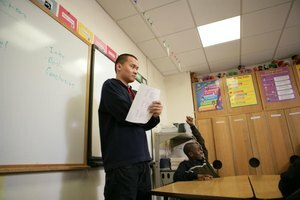 Time your speech--both the entire length and each section. This will help show you which parts may need to be trimmed back or enhanced. If you wish, use a video camera or a voice recorder to tape yourself. Make sure you write down all the Scripture references for your presentation. Depending on the topic you wish to speak about, some organizations may require you to have a college degree or other professional certifications before allowing you to speak. Always check with the leaders of the organization you are working with for their speaker requirements. S., Misty. 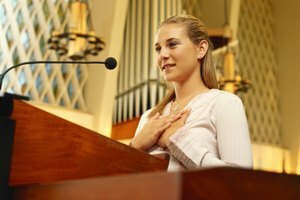 "How to Become a Christian Women's Speaker." 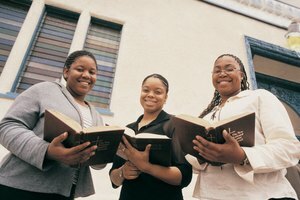 Synonym, https://classroom.synonym.com/how-to-become-a-christian-womens-speaker-12081501.html. 29 September 2017.